Frederick J.Smith, (8th child & 4th son of James Smith (North Shore Pottery), born Stockton 1844, death date not known. 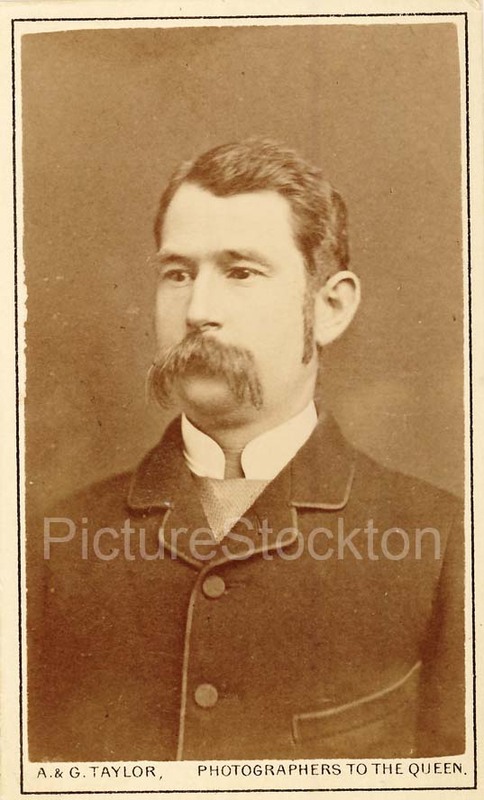 Little is known of him, but in some letters he wrote to my great grandfather (James Smith, born Stockton 1835, died 1893 Kerang, Victoria Australia), he gave his address as the Stockton Club. If anyone has any more information, it would be much appreciated. Photograph and details courtesy of Lynton Smith. By the 1890’s it is shown, as Cliff suggests, as part of the Exchange Buildings, with the Stockton Club, possibly facing onto West Row? It would have been next door to where Maddog music is (corner of west row and Exchange Yard). The Stockton Club was located in the Exchange Buildings on the west side of Stockton High Street. They were situated just before you get to Ramsgate from the Yarm Lane junction.